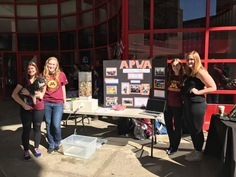 The APWA – MN Student Chapter has had a successful start to the 2016-2017 school year. They were also very active during the summer months; attending YP events, hosting a hole at the annual golf classic, and attending/volunteering at the first ever PWX conference. These events were a really great way to introduce students to chapter members. Students especially appreciated the opportunity to attend the Future’s Program at PWX and to expand their knowledge of public works while volunteering. Once the school year started, the group hosted an introductory event that encouraged non-registered students to register as chapter members, informed students of the benefits of joining the student chapter, and provided a timeline of events that will be held throughout the semester. The officers also participated in the CSE Student Organization Fair in which they exhibited a pervious pavement demo, generously lent by the City of Bloomington. This event was highly successful and gave the chapter more exposure to a variety of engineering students. The student chapter also received a second place award in the “Best Demo” competition. At the annual “Paint the Bridge” event on campus, APWA collaborated with ASCE to paint group logos on panels of the Washington Avenue pedestrian bridge. The most recent event was a technical tour of the Metropolitan Wastewater Treatment Facility in St. Paul. This tour was a great way to show students that Minnesota is on the cusp of innovative engineering practices and a wonderful way to connect what classroom knowledge with the real world. We had a great turnout - 27 students and one professional adviser attended the tour. After the tour, attendees socialized over appetizers. The student group was fortunate to be awarded a grant by Student Unions and Activities at the University of Minnesota, which paid for 90% of the cost of the event. See photo album of Student Chapter events. Visit the APWA UMN Student Chapter website here.